From December 11 to 12 a roundtable on HUL approach took place in Guangzhou to discuss how different stakeholders and entrepreneurs can participate of heritage management of this city. Local experts coming from the Department of Anthropology of Sun Yat-sen University, the Development and Reform Commission of Guangdong Province - Division of Social Development and the Intangible Cultural Heritage Protection Center in Guangzhou participated of this debate, giving a specific context of Guangzhou situation regarding conservation and public participation processes. Furthermore, Dr. Ron van Oers from WHITRAP (Shanghai) introduced the HUL approach and professor Kenneth Taylor form ANU gave an introduction to the rapidly transforming historic urban landscapes in China and Asia, while Ms. Susan FAYAD from the City of Ballarat in Australia and Mr. Krzysztof Chuchra from the City of Edinburgh in Scotland, presented different experiences of public-private partnerships in the management urban heritage. Mr. Harry Den Hartog from Tongji University presented changes of identity within the context of Shanghai’s development processes. The event was counted with the participation of different stakeholders of the city. 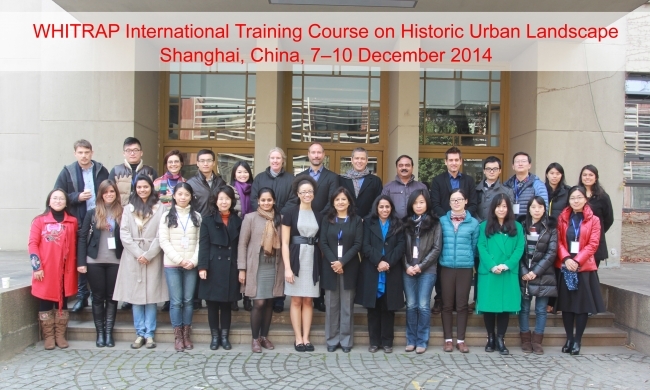 On 9 and 10 December 2014 an International Symposium on Historic Urban Landscapes was organized by WHITRAP and Tongji University in Shanghai, which brought together the implementing agencies and partners, as well as interested professionals from China and abroad, to take stock of progress made in HUL implementation in a diverse range of contexts. In total 100 participants came from different Chinese institutions, including the State Administration of Cultural Heritage (SACH), the China Academy of Urban Planning and Design (Beijing), the Office of Urban Conservation of the Shanghai Planning and Land Resources Administration, the School of Architecture of Tsinghua University (Beijing), the School of Architecture of Southeast University (Nanjing), the School of Architecture and Urban Planning of Huazhong University of Science and Technology, the Department of Urban Planning and Design of Xi’an Jiaotong-Liverpool University (Suzhou), the College of Architecture and Urban Planning of Tongji University (Shanghai), as well as international institutions and organizations, such as the UNESCO Cluster Office in Beijing, the American Planning Association (United States), The World Bank (Washington DC), PricewaterhouseCoopers (New York City & Shanghai branches), the University Institute of Architecture of Venice, the National College of Arts in Rawalpindi (Pakistan), the City of Ballarat (Australia) and The Australian National University in Canberra (Australia), among others. At the opening of the Symposium, the book launch took place of Reconnecting the City. The Historic Urban Landscape Approach and the Future of Urban Heritage, edited by Francesco Bandarin and Ron van Oers, and was handed out to the majority of participants. The Symposium established an International Scientific Committee for the Historic Urban Landscape Programme in China, which is chaired by Francesco Bandarin, Special Advisor on Heritage to UNESCO’s Director-General and Professor at the University Institute of Architecture of Venice. This Committee will meet once a year and has been tasked with the elaboration of an agenda for HUL implementation in China. This agenda is currently under development and will shortly be circulated to the symposium participants for endorsement. The Symposium was preceded by a concise Training Course, in which 23 international professionals (from India, Nepal, Malaysia, Indonesia, Germany, Italy, China and the United States) were updated on the concept, background and latest developments as regards HUL. The training concluded with a site visit to one of the HUL Pilot Projects in China, i.e. the Hong Kou District in Shanghai. A Memorandum of Understanding (MoU) was signed between the two institutions in order to establish a platform for joint activities. It aims the establishment of research and educational platforms under cooperation terms, focus primarily on planning practices for the conservation and management of cultural heritage, with exploration of Public-Private Partnerships (PPPs) and financial strategies and mechanisms for the conservation and management of cultural heritage according to the HUL approach. The ICOMOS Thailand International Conference on Historic Urban Landscapes and Heritage: Examples, Approaches & Cultural Rights, will be held from 11 to 13 December 2014. This event is organized as a platform for scholars, researchers and practitioners in the field of cultural heritage conservation to consider issues regarding the applicability of the Historic Urban Landscape concept for Thailand and the rest of Asia. Following the publication of The Historic Urban Landscape: Managing Heritage in an Urban Century, the new heritage management approach is now further elaborated with a much more practical slant. The first book dealt with the underlying theory related to scholarly traditions and contexts (European and non-European) as part of a broader international policy process initiated by UNESCO. This follow-up book translates the rather abstract notion of the Historic Urban Landscape into an operational set of management practices. In this second volume, the editors pull together specially commissioned chapters on best practice in urban heritage management from established professionals in the field. These chapter authors are drawn from a variety of disciplines related to urban management and conservation, present and discuss methodologies and practices to consider in the implementation of the Historic Urban Landscape approach as advocated by UNESCO. Maputo: Partial Development Plan for the Historic Center Baixa. The one-day visit was concluded with a guest lecture for staff and students of XJTLU related to the concept and application of HUL in China. As part of the HUL Pilot Project for the Historic City of Rawalpindi, which started in January 2013, the HUL approach and its application in Pakistan were explained in broadcast interview on the National Television of Pakistan. As part of the HUL application the project “Heritage Mapping of Rawalpindi City” was completed in collaboration with the WHITRAP. The mapping was done in light of challenges posed to conservation through urbanization and development. The NCA Director, Nadeem Omar Tarar, said “Urban and rural development projects are integrated with the ongoing historical and cultural preservation schemes in the light of UNESCO guidelines”. This mapping exercise included the compilation of information about the city’s environment, its historical and cultural landscape and prepared a list of the sites with the residents of the area while also collected oral history of the old buildings, data corresponding to historical sites and conducted interviews. At the same time, a list of the important historical buildings and places, traditional handicrafts and business centres was developed. Besides, the research addressed urban planning elements such as the mobility problematic, disposal of solid waste and sewerage system, as a way to approach in a comprehensive way the development and heritage conservation processes in the city that could influence the HUL application or development of specific cultural heritage policies in the future. Tarar said that Rawalpindi had dozens of historic religious buildings and completion of the project would help to finance the preservation of these sites that would also create employment opportunities through tourism. "This project will help the district government in planning urbanization in future”, he also said. The UNESCO Office in Dakar is associated with the organization of a conference about restoration policies and valorisation of the Historic Urban Landscape in francophone Africa, which will take place in Dakar from 7-9 July 2014. The conference is part of the preparatory work for the XVth Summit of the Francophonie. One of the main objectives is to introduce and discuss the Recommendation on the Historic Urban Landscape. Under the guidance of Mr. Donovan Rypkema and Dr. Ron van Oers, from 1 to 13 June 2014 UPenn’s Summer Fieldwork took place at WHITRAP–Shanghai. As part of the HUL research programme at the Pilot Site for Shanghai, students from the Historic Preservation Master Program of UPenn developed a Conservation and Development Strategy for the cluster of 8 lilong along the Hongkou River, focusing in particular on the economic feasibility and financial management of such a strategy. Specifically, a cost/benefit analysis of the eight lilong was conducted, including the ‘traditional’ financial cost/benefit calculations, meaning what would be the most economical solution, but supplemented with parallel analyses on the costs and benefits addressing social, cultural and environmental aspects. The final report of this fieldwork was presented to the authorities of Shanghai’s Hongkou area, as well as to other Chinese and foreign experts from Tongji University. It will form the basis for further work to be done in close cooperation with the local authorities to find an appropriate solution for the preservation and development of this area of downtown Shanghai. The workshop on ‘An Integrative approach to Heritage-Based Urban Regeneration in Ng’ambo’, as part of the World Heritage Site of Stone Town in Zanzibar, was held from 11–13 February 2014 as a joint event between the Government of Zanzibar and UNESCO. The workshop was part of a series of initiatives for heritage-based urban regeneration in Zanzibar, including a mapping and visioning exercise facilitated by UNESCO in early 2014. The Government of Zanzibar had invited a small team of experts to discuss the way forward in applying HUL to the ongoing urban regeneration activities in Ng’ambo (buffer zone of the WH site) on 11 and 13 February, while on the 12th the gathering grew into a conference with app. 100 local experts and stakeholder representatives exchanging their knowledge, experience and views. The recommendations have been drafted by the workshop participants, which worked under the guidance of AAmatters with students from Ardhi University of Dar es Salaam, SUZA University, Chandler University in Sweden, and Sheffield University in UK. A detailed report of the workshop, of which these recommendations will be a part, as well as a short video clip of the events are being produced by AAmatters and the Department of Urban and Rural Planning of Zanzibar and will be shared in the near future. PricewaterhouseCooper’s sixth edition of its Cities of Opportunity report has just been launched in China. It includes an interview with Dr. WANG Lin, Director of the conservation department in Shanghai’s Planning and Land Resources Administration Bureau, one of the driving forces in the development and implementation of the city Master Plan for 15 years, and Dr. Ron VAN OERS, combining insights into Shanghai’s extraordinary development in relation to other great cities in the world. The report is available at http://www.pwc.com/cities. The Faculty of Architecture and Urbanism at the University of Cuenca, Ecuador, is executing a project under the Institutional University Co-operation (IUC) programme with the Catholic University of Leuven's Raymond Lemaire International Centre for Restoration, entitled “World Heritage City Preservation Management”, which includes a research line on HUL for the World Heritage city of Cuenca. In the context of this project, the University of Cuenca is organizing a workshop on 29 May at the Faculty. The aim of this workshop is to gather a representative group of stakeholders in the city, such as the Municipality, INPC Instituto Nacional de Patrimonio Cultural (National Institution of Cultural Heritage), Pumapungo Museum, Barranco Foundation, and other professionals from diverse disciplines. The main purpose is to show the current state of the on-going research and to transmit the reflection around this tool and its use in preserving the cultural values of World Heritage city of Cuenca. Rutgers University Program in Cultural Heritage and Preservation Studies (CHAPS) and the Penn Cultural Heritage Center call preservationists, city planners, community leaders, academics and students to focus on new approaches to urban historic preservation and their relevance to urban conservation in New Jersey, New York, and the entire mid-Atlantic region. Central to the discussion will be the implementation of UNESCO’s Recommendation on the Historic Urban Landscape (HUL, 2011). On 19 March 2014 Edmonton, the capital of the Province of Alberta in Canada, hosted a stakeholder workshop on Whyte Space, the area around the principal avenue of the historic neighborhood of Old Strathcona in Edmonton. This stakeholder workshop was organized by ICOMOS-Canada, in association with the Old Strathcona Foundation (OSF), and with the cooperation of WHITRAP and the American Planning Association (APA). It was preceded by a public presentation, in the evening of 18 March, on the implementation of UNESCO’s Historic Urban Landscape approach in China by WHITRAP (Shanghai). The stakeholder workshop centered around a Cultural Mapping exercise as part of the HUL approach in which the participants identified and discussed the tangible and intangible heritage values of Whyte Space and the particular attributes where these values manifest themselves, for whom and when (distinguishing between day and night times). At the end of the workshop the participants unanimously agreed to include Edmonton as a Pilot City in WHITRAP’s Special Programme on HUL and a follow-up workshop on the elaboration of a development strategy for Whyte Avenue, which will include the tangible and intangible heritage assets identified in relation to the recently developed Statement of Significance for Old Strathcona, will be scheduled for October this year. From 6 to 11 March 2014 Mr. Donovan Rypkema, an expert in the economics of heritage preservation, President of Heritage Strategies International (Washington DC) and lecturer at the University of Pennsylvania's Historic Preservation Program (USA), paid a 5-day working visit to Shanghai to discuss the forthcoming Summer Fieldwork of UPenn in Shanghai, scheduled from 1 to 13 June 2014, as part of the longstanding cooperation agreement between UPenn and Tongji University. At the end of Mr. Rypkema’s visit, it was decided that UPenn’s Summer Fieldwork will focus on the elaboration of a Conservation and Development Strategy, in particular the economic feasibility and financial management of such a strategy, for the cluster of 8 remaining (i.e. Shanghai-style traditional housing complexes from the early 20th century) along the Hongkou River in downtown Shanghai, which is one of the Pilot Sites in WHITRAP’s Special Programme on HUL. The Summer Fieldwork will be jointly organized by the University of Pennsylvania, Tongji University’s Advanced Research Institute for Architecture and Urban-Rural Planning and WHITRAP. On Monday evening 10 March Mr. Rypkema gave a public lecture at WHITRAP on "The Economic Feasibility of Heritage Preservation: experiences from the US and abroad". On 7 February 2014 a tripartite Strategic Cooperation Agreement was signed between the District Coordination Office (DCO) of Rawalpindi, the National College of Arts (NCA) in Rawalpindi and WHITRAP in Shanghai, through which Rawalpindi in Pakistan became a Pilot City in WHITRAP’s Special Programme on HUL. As a follow up to an identification and preparation visit in July 2013, from 28 January to 8 February 2014 WHITRAP’s second mission to Rawalpindi took place to meet and discuss with NCA staff and (former) students, who are working on the HUL implementation in Rawalpindi since January 2013 with funding obtained from the Netherlands Funds-in-Trust at UNESCO. In addition, two stakeholder meetings were organized, one through the Institute for Social and Policy Sciences (I‐SAPS) and the other through the Pakistan Planning and Management Institute (PPMI), to present HUL to international agencies, NGOs and other potential partners in Pakistan and to consult them on strategy and cooperation activities for HUL implementation. Furthermore, during her visit to Pakistan at that same moment, UNESCO’s Director‐General Ms. Irina Bokova was briefed on the launch of the HUL programme in Rawalpindi. As part of the implementation of HUL in Pakistan the UNESCO Office in Islamabad has prepared an Urdu-language version of UNESCO’s brochure New Life for Historic Cities (accessible at the Pilot C ities section).